Home › Blog Notes & News › It’s Here!!!! 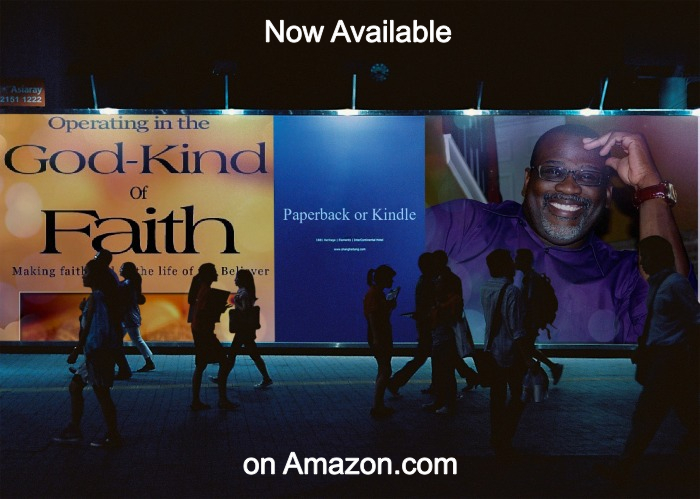 I am so happy to announce the publication of my first book: “Operating in the God-kind of Faith“. It is sure to enlighten, strengthen and encourage the Believer in your walk of faith! It is available at Amazon in paperback and on Kindle. You can click the book image on the right of the page to go directly to it. Whether you decide to purchase or not, I appreciate all of your support here on this blog. ‹ Marriage Monday: Adam, Where are You? Thank you…I really appreciate it! Blessings! Thank you dear Sister! Blessings to you! How exciting!! Keep serving Him well Dear Brother!! To God be the glory and may all who read this book know Him in a very personal relationship…or come to know Him in a personal relationship!! Amen!! And I am sure Mrs. Jill is sooo proud of her serving husband!! Please let her know…I am praying for both of you and your ministries!! Thank you K for your love, support, and encouragement! We so appreciate it! Blessings! Please do James! It is good to hear from you brother! Blessings! Yes indeed “Congratulations” Pastor keep up the good work!!! Thank you Pat, I appreciate it! Blessings! This is awesome! Congratulations on your latest publication! I’ll have to fire up my Kindle so I can read your book. May or Abba bless you as you bless Him. Thank you Brayden, I believe you will be blessed by it! Blessings! Brother Sebastian congratulations!! Well-done. I’m sure many will be blessed. I will get myself a copy. May the Lord continue to increase you for His glory. Blessings. Thank you so much for the encouragement! Blessings to you! Oh, congratulations, Brother Sebastian! It sounds like a wonderful book, and I know from what you post here that it will be strong in the Word. As soon as I get another paycheck, I’m ordering one. Thank you for your kindness! May the Lord increase you with all you need and much more! That’s cool! Congratulations on your new book praising God with you. God bless you, brother Sebastian. And you as well my brother! You’re welcome my Brother! Blessings!